Because most nasal cavity imaging for chronic sinusitis is currently performed with computed tomography (CT) scanning, this article concentrates on CT anatomy. Understanding the anatomy of the nasal cavity and its anomalies is important because it leads to an understanding of imaging anatomy, which is needed to plan the surgical approach. Common anatomic variations are also discussed. Readers are urged to review anatomic texts before reading this article. 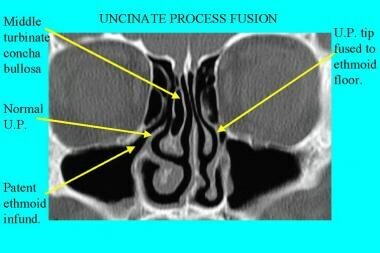 To see complete information on Imaging in Sinusitis, please go to the main article by clicking here. The following image is an example of CT scanning of the nasal cavity. CT scan, nasal cavity. Normal anterior ostiomeatal complex anatomy. The anatomy of the ethmoid infundibulum and the uncinate process is demonstrated here. For more information, see Sinusitis, Chronic. For more information, see Sinusitis, Acute. The nasal cavity warms and humidifies inspired air and filters out small airborne particles before air reaches the lung. The nasal cavity is lined with the same columnar epithelium that lines the airways of the lung. This epithelium secretes a mucinous substance that coats the walls, aiding in mucociliary clearance of small particles trapped on the mucosal surface. The nasal cavity also provides drainage for secretions from the paranasal sinuses and traps odor-bearing particles for olfaction to the olfactory recesses. The olfactory recesses are located at the superiormost portion of the nasal cavity, medial to the paired superior turbinates. The nasal cavity is surrounded by air-containing mucosal-lined cavities called the paranasal sinuses, which include the paired maxillary, frontal, ethmoid, and sphenoid sinuses. The sinuses communicate directly with the nasal cavity and their secretions drain into it via the ostia. The walls of the sinuses secrete mucinous material. They are lined by cilia that sweep the mucinous carpet and secretions with trapped particles in a defined pathway toward the ostia. The floor of the nasal cavity is the hard palate. The lateral walls contain spiral-shaped mucosal folds overlying concha-shaped bone called turbinates and various sinus-drainage ostia. The spiral or curved nature of the turbinates increases the surface area and contact with inspired air. The roof is composed of the cribriform plate in the middle and the floors of the ethmoid air cells on either side. The nasal cavity is separated into halves by the partially bony and partially cartilaginous nasal septum. Unlike the lateral walls, the septum is lined by squamous epithelium. Paired frontal, maxillary, ethmoid, and sphenoid sinuses surround the nasal cavity. Ethmoid sinuses form the roof, and maxillary sinuses form the walls. Frontal sinuses are anterior to and superior to ethmoid sinuses, and sphenoid sinuses are posterior and superior to ethmoid sinuses. 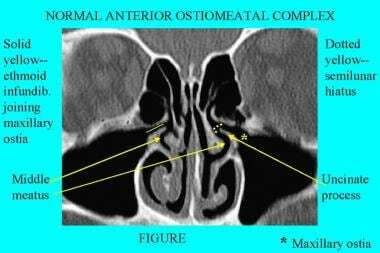 The major draining ostia are the anterior ostiomeatal complexes (OMCs), which drain the bilateral frontal and maxillary sinuses and the anterior and middle third of the ethmoid sinuses, as seen in the following image. The uncinate process (UP) and lateral wall of the nasal cavity form the ethmoid infundibulum (EI). The above sinuses drain into the EI via various ostia. The maxillary sinus ostia and the frontal sinus recess or duct drain into the anterior-most portion of the OMC and are consistently identifiable on CT scan, as seen in the following image. CT scan, nasal cavity. Normal frontal recess/duct. Frontal sinus empties into the middle meatus just lateral to the more anterior portion of the middle turbinate. The most anterior ethmoid air cells are called agger nasi cells. Other ostia form the anterior and middle third of the ethmoid air cells and drain into the EI but are not seen even in routine 2-mm coronal CT imaging. When the frontal sinuses, maxillary sinuses, and anterior two thirds of the ethmoid sinuses are involved with sinusitis, this grouping of sinuses may be referred to as the infundibular pattern. This is the most common pattern encountered in chronic sinusitis. Processes involving the anterior ethmoid chambers control maxillary and frontal sinus drainage into the EI. The most common cause for frontal and maxillary sinusitis is anterior ethmoid disease and a superimposed rhinitis, whether viral or bacterial. Diseased mucosa of the draining ostia leads to impairment of secretions and mucociliary clearance, resulting in sinusitis in the maxillary and frontal sinuses. Clearing or treating anterior ethmoid disease clears frontal and maxillary sinusitis. Defined pathways of clearance in the maxillary and frontal sinuses exist and have been documented by using dye drops. Readers are urged to review standard ear, nose, and throat (ENT) textbooks regarding the physiology of mucociliary clearance, especially the works of Stammberger and Messerklinger. 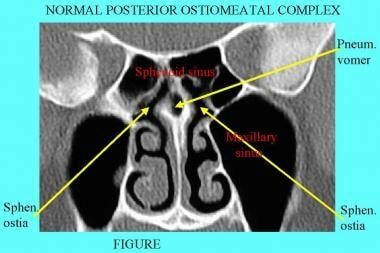 A posterior OMC, located in the sphenoethmoid recess, drains the posterior third of the bilateral ethmoid and the sphenoid sinuses, as seen in the image below. The vomer separates the 2 ostia into the sphenoid sinus. In chronic sinusitis, this complex is involved less commonly than the anterior OMC because the anatomic variations are fewer. CT scan, nasal cavity. Normal posterior ostiomeatal complex. The vomer separates the two ostia into the sphenoid sinus. These ostia are located in the sphenoethmoid recess. The vomer is normally pneumatized. A normal sagittal reconstruction of the OMC, showing the curved edge of the semilunar hiatus with the inferior mucosal edge covering the UP, can be seen in the image below. The frontal recess is also shown. CT scan, nasal cavity. This reformatted image of a normal sagittal reconstruction of the ostiomeatal complex shows the curved edge of the semilunar hiatus with the inferior mucosal edge covering the uncinate process. The frontal recess/duct is also shown. The anterior superior septum is composed of cartilage. The posterior superior septum contains the perpendicular plate of the ethmoid bone, and the inferior septum contains the vomer and the nasal crests of the maxilla and palatine bones. The bony portion of the septum is often pneumatized; when overexpanded, it may impair airflow into the bilateral sphenoid ostia (which are visible adjacent to the vomer on both sides on coronal CT images) in the sphenoethmoid recess. Spurs and deviation of the septum may impair airflow, especially if the spur or deviated septum compresses the turbinate mucosa or lateral wall of the nasal cavity. Severe nasal septal deviation may obstruct the airway and compress the turbinates. The anatomy of the lateral wall of the nasal cavity is quite complex and is where most anatomic anomalies occur. Usually, individuals have 3 paired turbinates: superior, middle, and inferior. Some individuals have a fourth turbinate, the supreme turbinate. The space between the turbinates along their lateral margin and the lateral walls of the nasal cavity is referred to as the meatus. The inferior turbinate is attached to the lateral wall of the nasal cavity, and only the nasolacrimal duct drains into the inferior meatus. Most of the inspired airflow travels through the middle meatus rather than through the inferior. Functionally, the middle meatus is the most important because the maxillary sinuses, anterior two thirds of the ethmoid sinuses, and frontal sinuses drain into it. Most anatomic variants occur in the middle meatus and turbinate region. The posterior third of the ethmoid and sphenoid sinuses drain into the superior meatus. The UP, which forms part of the anterior OMC, is one of the most important bony structures. The UP acts as an air vent shield, preventing direct inspiration of air into the maxillary sinus and protecting the egress of the mucociliary clearance. Simple allergic or even viral rhinitis and anatomic variations of the UP may narrow the EI, resulting in obstruction of normal sinus drainage. This bony structure is central to functional endoscopic sinus surgery (FESS) because it is the first structure to be identified and surgically removed. The UP arises from the lateral wall and occasionally from the inferior turbinate and projects into the airway of the nasal cavity. Its superior margin is attached to the floor of the anterior ethmoid sinuses and then decreases in height toward the nasopharynx, with its superior free edge forming the semilunar hiatus that opens directly into the middle meatus. The orbital floor or medial wall is lateral to the UP, with the EI lying between them, directly draining the maxillary sinus through its ostia at the anterior, medial, and superior corner. Various ethmoid air cells in the anterior two thirds also drain into the infundibulum, as do the frontal sinuses. The frontal recess or draining duct drains into the anterior ethmoid portion of the middle meatus. Overexpansion of agger nasi cells, the most anteriorly located ethmoid air cells, may compress this draining channel. Thus, the bilateral frontal and maxillary sinuses and the anterior two thirds of the ethmoid sinuses drain into the EI. Many anatomic variations of the nasal cavity exist. These variants may impair airflow by producing areas of relative narrowing or total obstruction, predisposing the patient to repeated bouts of sinusitis. Swelling of the mucosa may be caused by allergic, viral, or bacterial sinusitis. Infections of the nasal cavity lead to obstruction of sinus drainage, resulting in the pain, headache, and congestion of acute sinusitis. Eventually, complications such as orbital cellulitis, abscess formation, and mucocele may occur. Surgical means of alleviating the symptoms of sinusitis have evolved from antrectomies to more functionally, as well as endoscopically, guided techniques. The UP anomalies are by far the most common anomalies encountered in the nasal cavity in individuals with chronic sinusitis. UP anomalies include elongated, lateral or medial deviation, as well as others. The most common anomaly is elongation and apparent fusion of the UP tip to the floor of the ethmoid sinus on CT scan, as seen in the image below. However, although the semilunar hiatus appears to be absent, the maxillary sinus is fully developed. The UP is not really fused and can still be surgically removed with FESS. This common distortion of the anatomy further restricts outflow of secretions by markedly narrowing the semilunar hiatus. CT scan, nasal cavity. Fusion (apparent) of uncinate process to the ethmoid floor. Note the normal uncinate process on the other side. Airway flow is compromised from the sinuses to the middle meatus because of the functionally occluded semilunar hiatus. Because the maxillary sinus is patent and aerated, this is not a true congenital fusion. If the UP tip fuses to the inferomedial floor of the orbit, the maxillary sinus ostium is absent. In addition, the UP tip is deviated in a lateral direction. This fusion is real and congenital in nature, as seen in the image below. As a result, no semilunar hiatus exists; therefore, no communication occurs between the maxillary sinus and the middle meatus. The EI ends in a blind pocket (ie, recessus terminalis). The sinus is usually hypoplastic and nonaerated and therefore has never developed. In patients with this anomaly, the usual surgical incision at the base of the UP in FESS would result in direct orbital injury. CT scan, nasal cavity. Congenital or true fusion of the uncinate process to the orbit floor. The maxillary sinus is hypoplastic and not aerated. The ethmoid infundibulum does not exist or ends blindly as the recessus terminalis. The UP tip can also fuse directly to the lateral wall or lamina papyracea of the orbit. This anomaly produces the same imaging findings as inferomedial fusion. If the UP is deviated in a medial direction, it obstructs airflow into the middle meatus and may compress the mucosa of the nasal turbinate. The EI is patent and most likely communicates directly with the ethmoid ostia, thereby linking the maxillary sinus directly to the ethmoid sinuses. Pneumatization of the UP tip is another common anomaly, as seen in the image below. It expands the tip and may compromise the EI and semilunar hiatus. In rare cases, an osteoma can even occur in the UP. If the osteoma base is expanded, it may compromise the airways and EI. With the exception of the blind-ending EI or recessus terminalis, FESS corrects ethmoid infundibulum narrowing by removing the UI and opening a direct passage into the nasal cavity for the sinuses. CT scan, nasal cavity. Bilateral pneumatization of the uncinate tips. Expansion of the tips can compromise the ethmoid infundibulum, the semilunar hiatus, or the middle meatus. In rare cases, a spur may arise from the UP and compromise the EI or middle meatus, depending on which way the spur tilts. Rarely, the UP may be entirely absent. This, of course, does not compromise drainage from the maxillary sinus to the middle meatus, but the EI and semilunar hiatus are absent. The absence of a UP poses a serious potential risk during FESS. The endoscopist may mistakenly incise the lateral maxillary sinus wall or, more importantly, the medial and inferior walls of the orbit, resulting in injury to the orbital contents. Concha anomalies are probably the most common anatomic variant of the nasal cavity, even more common than those of the UP. However, only a few concha anomalies lead to airway obstruction and chronic sinusitis with its attendant complications. The most common anomaly is pneumatization of the concha, which is called a concha bullosa. As the name implies, portions of the concha are aerated; this occurs either in the vertical portion that attaches to the cribriform plate or lateral nasal cavity walls or in the concha or curved (shell-like) portions of the concha. Cases involving the inferior turbinate are extremely rare and reportable, while concha bullosa of the supreme turbinate has not been reported to date. Pneumatization of the vertical or conchal portion is usually of no clinical significance. However, if the conchal portion of the middle turbinate is expanded significantly, the concha may compress or deviate the UP against the lateral wall of the nasal cavity and narrow the EI, as seen in the image below. Likewise, overexpansion compresses the middle meatus into which the ethmoid infundibula drain. Therefore, concha bullosa can also be classified into the group of lesions that narrows the EI. CT scan, nasal cavity. Concha bullosa of the left middle turbinate with expansion and narrowing of the ethmoid infundibulum and the middle meatus. Note absence of the right uncinate process, another anatomic variant. 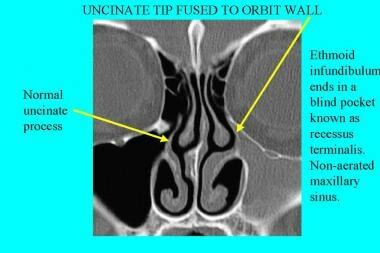 Another anomaly of the nasal cavity with the potential for airway compromise and chronic sinusitis is the paradoxical turbinate. 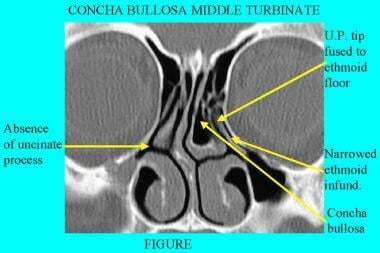 As with the concha bullosa, the most significant paradoxical turbinates involve the middle turbinate. Normally, the curved portion of the turbinate concha is adjacent to the nasal septum or points toward the septum. If the curve is sufficiently exaggerated, it compresses and deviates the UP toward the lateral nasal cavity wall, compromising the EI. Usually, paradoxical turbinates occur where the mucosa is hyperplastic. The overgrowth causes the mucosa to buckle and fold inward, with the resultant curve pointing toward the septum. The curved portion of the more posterior portion of the turbinate is typically directed toward the nasal septum. Occasionally, the concha mucosal portion may be deformed at the point where the mucosa starts to fold inward. In these cases the anomaly resembles a boxing glove with the knuckle portion directed toward the floor of the nasal cavity. The presence of accessory turbinates is another anomaly that most often occurs in the region of the middle turbinates. Like the main turbinates, the accessory turbinates have a curved surface and a thin, inner, shell-like, bony structure. The bony structure contained within allows this anomaly to be differentiated from polyps, which lack the bony portion. The accessory middle turbinates are either attached to the lateral nasal cavity wall or to the floor of the ethmoid sinus. Usually, the accessory turbinates are too small to compromise the airway. Another rare anomaly is a duplicate turbinate, in which 2 of the same turbinate occupy the same region. The vertical and conchal portions are exact copies of the original turbinate. When this occurs in the region of the middle turbinate, the presence of the additional turbinate can narrow and compromise the EI. Attachment of the turbinate to another turbinate, rather than to the lateral wall of the nasal cavity, is another and even more rare anomaly. A spur can arise from the turbinate and may interfere with the airflow, depending on its location. In addition to the UP and concha anomalies already discussed, the next group of anomalies narrows the EI and may impair sinus drainage. 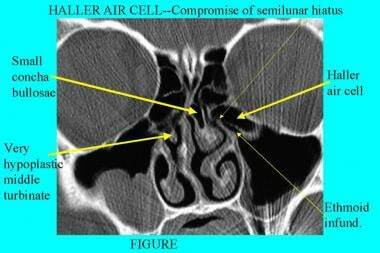 Haller air cells occur along the inferomedial orbital wall and, if expanded, can narrow the EI at the maxillary sinus ostia, as seen in the image below. Controversy exists over what constitutes a Haller air cell. Generally, the Haller air cell is related to the inferomedial wall/floor of the orbit. The Haller air cell has been suggested to simply be an overexpanded ethmoid air cell. CT scan, nasal cavity. Large Haller air cell clearly narrowing the ethmoid infundibulum. 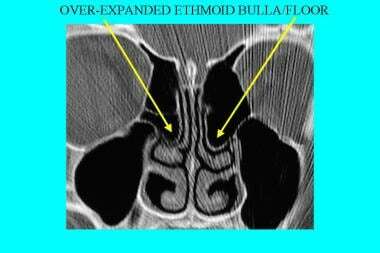 Overexpansion of the ethmoid sinuses or bulla (ie, giant ethmoid bulla) is possible, as seen in the image below. In this situation, downward bowing of the floor of the ethmoid sinus occurs, such that it encroaches on and narrows the semilunar hiatus. The downward bowing can also displace the UP in a lateral direction and narrow the EI. CT scan, nasal cavity. Overexpansion of the ethmoid sinus floors. Floors bulge downward, compressing the middle turbinate and compromising the semilunar hiatus (not shown on this image). Nasal polyps can also affect the EI. Most nasal polyps arise from the region of the anterior ethmoid air cells and in relation to the UP, middle turbinate, and EI. Nasal polyps also originate from the anterior aspect of the ethmoid floor. In this location, the mass effect from the polyp can compromise the semilunar hiatus, extend into the EI, or extend medially between the UP and middle turbinate, occluding the middle meatus. Polyps tend to arise from areas where opposing mucosal surfaces are in contact with each other. In this sense, an anomaly of the UP with the associated mucosal surface contact may be a causative agent for polyp development. The soft tissue mass of nasal polyps obliterates the airways and makes CT interpretation difficult, particularly if the entire nasal cavity is filled with soft tissue. If large enough, a nasal cavity polyp may displace the medial wall of the maxillary sinus in a lateral direction. Choanal polyps are a special subclass of polyps, arising from the maxillary sinus posterior or lateral walls. The polyp can initially grow into the maxillary sinus ostia and then into the EI, causing obstruction. Because of their origin with the maxillary sinus, choanal polyps displace the medial wall in a medial direction into the nasal cavity. Anatomic variations that do not lead to chronic sinusitis are also important for the endoscopist to be aware of, because they pose the potential for injury to the patient. Old fractures of the orbit or dehiscences of the lamina papyracea allow herniation of orbital contents into the ethmoid sinus, most notably orbital fat or middle rectus muscle. These structures and the nearby arteries may be injured during FESS if the surgeon is unaware of these anatomic distortions. The herniated orbital contents are encountered after the UP is removed, the floor of the ethmoid sinus (bulla) is pierced, and the ethmoid sinus is entered. UP anomalies include fusion of the UP to the orbit wall or floor and absence of the UP. Fusion to the orbit may cause the endoscopist to inadvertently enter the orbit, injuring its contents during an attempt to resect the UP. Absence of the UP may cause the endoscopist to incorrectly identify the orbital wall or floor as the process, also leading to injury of the orbital contents. Absence of the basal or ground lamella is problematic only if FESS of the posterior OMC is being considered. Once the UP has been surgically removed, the endoscopist then punctures the floor of the ethmoid sinus. The basal or ground lamella separates the anterior two thirds of the ethmoid air cells from the posterior third. If the basal lamella is absent, the endoscopist may mistake the cribriform plate for the basal or ground lamella. 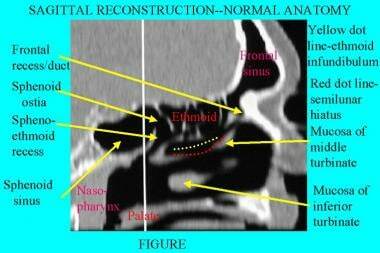 Other anomalies relevant to FESS of the posterior OMC include bony septa in the sphenoid sinus that attach directly to the bony carotid sulcus in the outer walls of the sphenoid sinus. Removing these septa may injure the carotid artery by fracturing the sulcus. Extensive skull base pneumatization may cause the Vidian nerve within the Vidian canal to appear as a bony elevated ridge that seems to float above the floor of the sphenoid sinus. What appears to be another bony septum contains the Vidian nerve. Injury to this nerve mainly affects tearing. Accessory turbinates may be mistaken for polyps or, if large enough, for 1 of the 3 major turbinates. Choosing the wrong turbinate causes the endoscopist to be in the wrong meatus. However, most of these accessory turbinates are small. Preoperative imaging helps to identify unsuspected old fractures or congenital deformities that distort anatomy and predispose the orbit, skull base, optic nerves, and carotid arteries to injury during FESS. High-resolution CT scanning with thin coronal slices provides the most useful surgical information because the orientation of the anatomy is similar to the orientation of the anatomy encountered in FESS. Axial images do not show certain ostia as well as the coronal projection but can still provide additional information. CT scanning for chronic sinusitis is most often performed in the coronal plane. Images in the sagittal plane are useful when surgery of the frontal recess and frontal sinus is going to be performed. Most protocols for CT scanning of the sinuses use a coronal position with slices 2-3 mm in thickness. These protocols are readily available as part of most CT software packages. Some institutions use thin-section axial CT images that are reformatted in the coronal projection. Reformatted images in the coronal plane have less spatial resolution in the superior-inferior direction than direct coronal scans. However, these images may be digitized and downloaded to an intraoperative computer for virtual reality display, superimposing them over the direct endoscopic images seen by the surgeon. Patients should not undergo scanning during active sinusitis or rhinitis because edema and mucosal swelling obliterate nasal structures, masking any underlying anatomic anomalies. Prior to CT scanning, most patients are treated with nasal decongestants or antihistamines to shrink the nasal mucosa. However, if complications such as orbital abscess or periosteal osteomyelitis occur, CT scanning should be performed to assess these acute processes. Dental metallic devices are one of the most significant causes of CT scan degradation. These devices cause considerable streak artifacts that obscure the nasal cavity and sinus anatomy. Changing the angle of the CT gantry avoids scanning through metallic braces or other orthodontic devices. However, the change in angle may not render a true coronal projection and thus may not show the draining ostia and channels. When streak artifacts degrade direct coronal scans, inversion of black and white may help. Bone is changed from its normal white to black, and air is changed from its normal black to white. Thus, white air channels and spaces are easier to visualize, and streak artifacts have been inverted to black, making them less obvious. 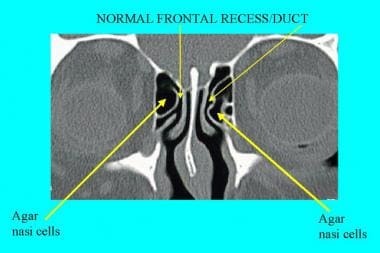 For more information, see Imaging in Sinusitis. Spiral CT scans offer the ability to reformat images at 1-mm intervals, which is necessary in order to identify the draining ostia. The ability to reformat images in any other planes, especially the coronal views, is important to current CT scanning. The coronal view is the closest to the actual anatomy encountered by the endoscopist. Because of the high quality of reconstructed images, patients no longer need to be put in awkward positions (ie, prone or supine with their head fully extended) in order to achieve a direct coronal scan. The axial images may be spaced as close as 1-mm thin slices. However, they still do not show the status of the draining ostii as well as the coronal views. The other advantage of being able to reformat images without putting the patient under stress is that artifacts from dental appliances are minimized. With direct coronal scanning, the artifacts project right into the sinus and draining ostia. In the axial plane, these images occur only on 3-4 slices. When the images are reformatted in the coronal view, the artifacts affect the axial levels only, and thus do not obscure the entire coronal view. MRI is the imaging of choice for evaluating soft tissue and is therefore ideal for analyzing extrasinus pathology, fungal disease, and concerning sinonasal masses. The exclusive use of coronal CT scans for sinus imaging could result in the failure to diagnose nasal cavity neoplasms. In the absence of bone destruction, an esthesioneuroblastoma or other neoplasm may be mistaken for a nasal polyp on a CT scan, whereas on MRI, the nature of this tumor is quite apparent. Beyond anatomic variants, any suspicious findings should be imaged by means of MRI. Despite advances in MRI technology, insufficient tissue, plus the problems of susceptibility due to the air-containing passages, make MRI a less effective study for nasal cavity sinusitis problems, unless of course the sinusitis turns out to be related to squamous cell carcinoma (SCCa). To date, no new MRI contrast agents that have an affiliation for SCCa have been released. For more information, see Imaging in Sinusitis,. Likus W, Bajor G, Gruszczynska K, et al. Nasal region dimensions in children: a CT study and clinical implications. Biomed Res Int. 2014. 2014:125810. [Medline]. [Full Text]. Dietz de Loos D, Lourijsen ES, Wildeman MAM, et al. Prevalence of chronic rhinosinusitis in the general population based on sinus radiology and symptomatology. J Allergy Clin Immunol. 2019 Mar. 143 (3):1207-14. [Medline]. Ila K, Yilmaz N, Oner S, Basaran E, Oner Z. Evaluation of superior concha bullosa by computed tomography. Surg Radiol Anat. 2018 Jul. 40 (7):841-6. [Medline]. Koo SK, Kim JD, Moon JS, Jung SH, Lee SH. The incidence of concha bullosa, unusual anatomic variation and its relationship to nasal septal deviation: A retrospective radiologic study. Auris Nasus Larynx. 2017 Feb 4. [Medline]. Virgin F, Ling FT, Kountakis SE. Radiology and endoscopic findings of silent maxillary sinus atelectasis and enophthalmos. Am J Otolaryngol. 2008 May-Jun. 29(3):167-70. [Medline]. Zoumalan RA, Lebowitz RA, Wang E, Yung K, Babb JS, Jacobs JB. Flat panel cone beam computed tomography of the sinuses. Otolaryngol Head Neck Surg. 2009 Jun. 140(6):841-4. [Medline]. The CT scan shows an opacified middle turbinate concha bullosa (D). The resulting occlusion of the ethmoid infundibulum (B) causes an acute ethmoid sinusitis, most likely related to direct communication of the infection from the concha to the infundibulum and thus to the ethmoid sinus. The expanded concha bullosa narrows the middle meatus (E) and deviates the uncinate process (C) toward the nasal cavity wall, narrowing the ethmoid infundibulum (B). This narrowing led to repeat sinusitis and eventually to a bacterial infection. The lamina papyracea is normally riddled with small holes for perforating arteries. From there, the infection spread directly from the infected ethmoid sinus into the orbit to manifest as a supraorbital abscess (A). Following antibiotic therapy during the acute crisis, the infection was brought under control after drainage of the supraorbital abscess. Functional endoscopic sinus surgery (FESS) was performed at a later time. The normal basal or ground lamella is seen on the right side (B). On the left side, the arrow (A) points to the expected location of the absent basal lamella. Therefore, the first mucosal bony structure encountered after puncturing the ethmoid floor was the cribriform plate. Puncture of this structure resulted in a CSF leak.